The muscles of the arm and hand are specifically designed to meet the body’s diverse needs of strength, speed, and precision while completing many complex daily tasks. Activities such as lifting weights or heavy objects require strength from the muscles of the arm. Writing, painting, typing all require speed and precision from the same muscles. Complete athletic activities such as boxing or throwing ball require arm and hand muscles to be strong, fast and precise all at the same time. Muscles located in front of your upper arms. Muscles located at the back of your upper arms. 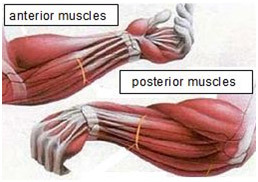 Muscles of lower arms between the elbow and the wrist. 2 - the short head located on the inside of your upper arms. Both heads are joined at the elbow and help to bend the elbow. 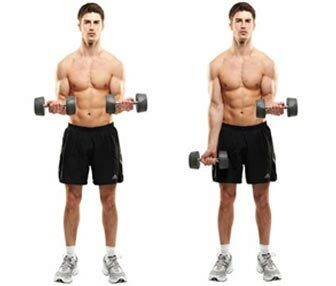 The biceps muscle controls the motion of two different joints, the shoulder and the elbow. Your Bicep Muscles are solicited whenever you are engaged in a pulling motion where you are curling your elbows and when you are engaged in the rotation of your forearms. 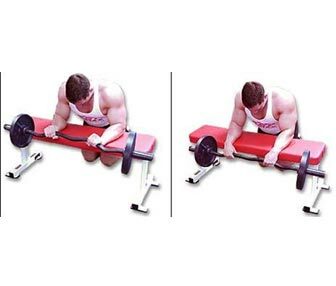 As such, bicep exercises will usually require the use of neighbouring muscle, notably the inside forearm muscles as well as the back of your shoulders (rear deltoids). 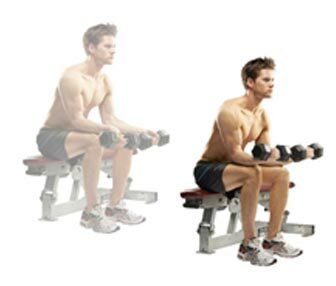 Bicep exercises can be performed using a wide variety of fitness equipment. The most notable bicep exercises are Barbell Curl, Dumbbell Curl, Preacher Curl, Concentration Curl, Machine Curl and Cable Rope Hammer Curl. 1 - The Long Head starts of higher up on the shoulder blade. 2 - The Lateral Head is on the outside of the arm. 3- The Medial Head located below the lateral head and above the elbow. The three heads are joined at the elbow and work to straighten the elbow. 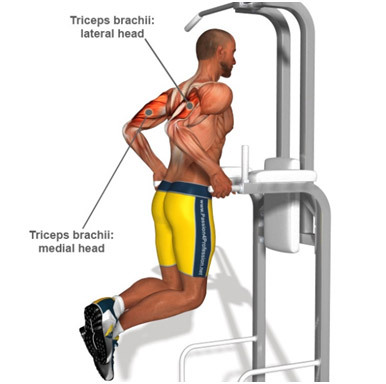 Your tricep muscles are solicited whenever you are engaged in a pushing motion where you are extending your elbows. As such, tricep exercises will usually require the help of neighbouring muscles, notably the chest, shoulder and inner forearm muscles. 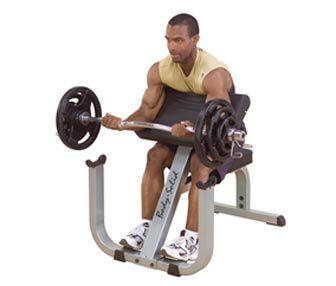 Tricep exercises are performed using a wide variety of fitness equipment. 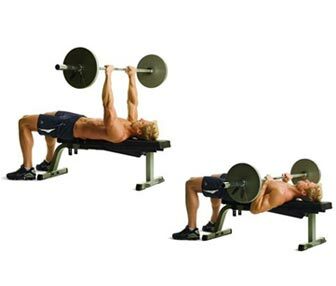 The most notable tricep exercise are Lying Tricep Extension, Skull Crushers, Close Grip Bench, Tricep Pushdown, Bench Dips, and Overhead Tricep Extension. 1 – Anterior muscles also known as flexors: located in front of the forearm and play a role in bending the wrist and fingers and forming a fist. 2 – Posterior muscles also known as extensors: located in the back of the forearm and work to extend or straighten the wrist and fingers. When you are holding things, both groups of muscles work together to grip and stabilize the fingers and wrists. These muscles regulate the movement of the wrist, fingers, thumb and control turning hands face up and down. Flexion is the bending movement and extension is the straightening. You flex your elbow when you bring your forearm up toward your upper arm and you extend your elbow when you move your forearm away from your arm to straighten your elbow. Some of the basic forearm exercises are Barbell Wrist Curl, Reverse Wrist Curl, Reverse Curl, Hammer Curl and Dumbbell Wrist Curl. Big Muscular Arms In Men: The arms are one muscle group that gets more attention than any other muscle and instantly let’s everyone know that you are strong and muscular. Whenever men wear a short sleeve shirt their arms are on display and a muscular arms are instantly noticeable. First impression of a man is based on the size and the shape of their arms. The simple truth is that practically everyone admires a well-developed muscular arms and associates the man with having strength. - Strong handshake which makes a man more confident and dependable. 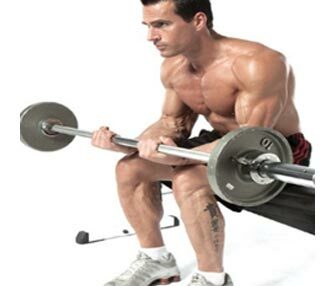 - Heavy lifting which will help him increase his training results and strength. - Better Endurance which will enable him to perform more repetitions per set of an exercise. Benefits Of Arms Training For Women: Every women wants to have beautifully toned, defined and sleek arms. And the only way to have sculpted arms is to pick up weight and get to work. Strengthening the arms will make them look great as arms tend to show every time you do something. A well toned, firm arms look super attractive especially if they are defined with lean muscle tissue. A women with strong arms can also help prevent osteoporosis, strengthen the spine and improve posture.